I’m always one to try something new, although I’m certainly no Masterchef in the making! 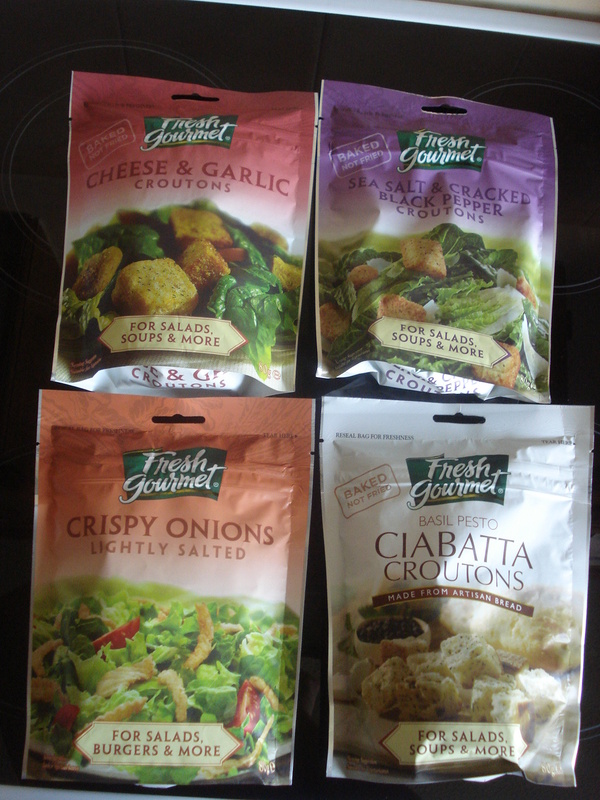 I received a parcel a couple of weeks ago with some products from Fresh Gourmet – the number one brand of croutons and toppings in the USA, who are now launching in the UK. I’ve only really ever used croutons with soup, and didn’t really fancy that idea with the weather we’ve been having lately, so I thought we’d try the Ciabatta Croutons with Basil Pesto first. I’d baked some salmon and added the croutons to a crispy side salad. 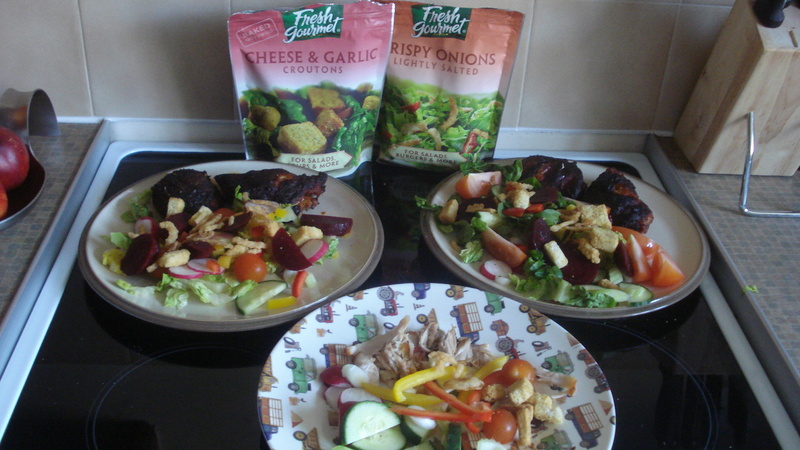 The croutons tasted wonderful, we all love pesto and basil and the flavours really come alive as you bite into the croutons. They were a hit, and actually I quite like just munching them as a snack! 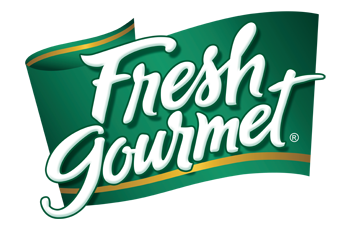 I am longing to try them with a homemade tomato soup. 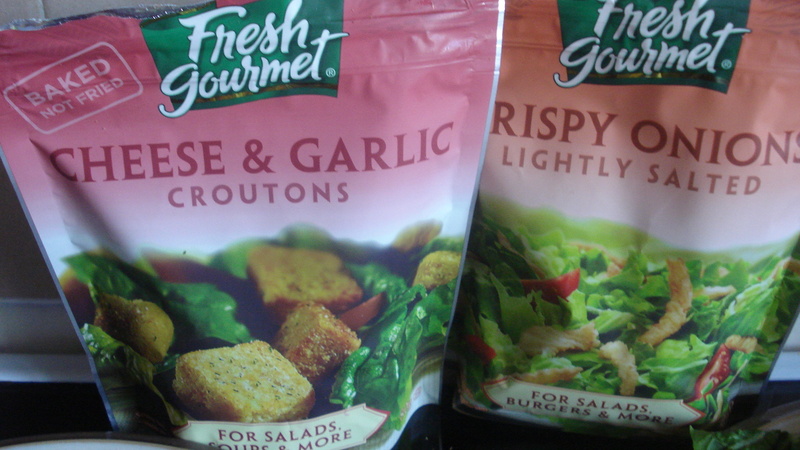 A few days later I decided to try the Cheese and Garlic Croutons and Lightly Salted Crispy Onions. I baked some chicken thighs in the oven, which had been marinated in sweet chilli sauce, and added the croutons and crispy onions to the salad. My Monkey son, aged 3 and half years particular loved the Cheese and Garlic croutons. I think he’d have eaten the whole packet then and there. They taste exactly as you would expect and as Monkey’s favourite thing ever is cheesy garlic bread you I just knew he’d like these. I’m going to try them with a pasta bake next I think. Think they’d taste really good with that kind of dish. None of us were too keen on the onions, but we’re having a BBQ on Sunday so I’m going to try them again with a good old-fashioned burger and see what the taste team think then!